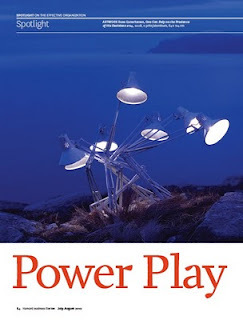 POWER IS REQUIRED IF ONE WANTS TO GET ANYTHING DONE in any large organization. Unfortunately, Power doesn’t just fall into one’s lap: one will have to go after it and learn how to use it. Stanford University professor for Organizational Development, Prof. Jeffery Pfeffer, argues that being uncomfortable with Power Dynamics has cost career promotions (and sometimes, the job) to many talented people from premier organizations and institutes including Harvard and Sloan. 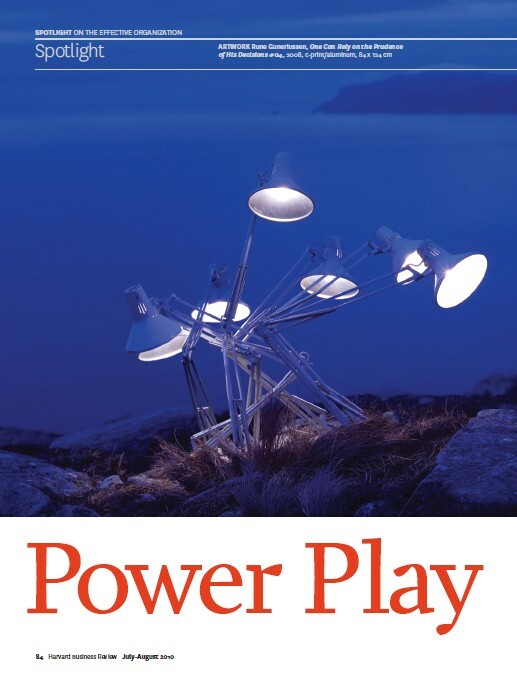 Pfeffer offers a primer on why power matters, how to get it, and how to use it to advance your organization's agenda - and thus, in turn, how to furthering your career, not just incidentally. In his brilliant article titled "Power Play" in the latest issue of HBR magazine Pfeffer discusses the following basic idea. The article headline reads: "Acquiring real clout—the kind that helps you get stuff done—requires bare-knuckle strategies." Written more as a survival guide for any new 'idea' to progress, Pfeffer identifies personal barriers that the leader has to overcome. The article explains 11-point exercise towards the Paths of Power, acknowledging all along that it is not the ideal world that the techniques apply to, but rather it is for the real world that one deals with, and which is much less 'ideal' and just than all of us may want it to be. Any new strategy worth implementing has some controversy surrounding it and someone with counteragenda fighting it. When push comes to shove, you need more than logic to carry the day. You need power. Learning to wield power effectively begins with understanding the resources you control. Money is not the only one. Whatever you have - a valuable network, access to information - can be meted out or denied to gain leverage. You can also push past obstacles through sheer relentlessness. You should avoid wasting political capital on side issues and dispense with opponents in ways that allow them to save face. You may find such power plays and the politicians behind them unsavory - and they can be. But you'll have to get over your qualms if you want to bring about meaningful change. Pfeffer identifies three main barriers that can make you 'your own worst enemy' unless you learn how to get over them and embrace the power you need. 1) The Belief That the World Is a Just Place: Believing in a just world makes people less powerful in two important ways. First, it limits their willingness to learn from all situations and all people, even those they don’t like or respect. Second, it anesthetizes them to the need to proactively build a power-base. 2) The Leadership Literature: The teaching on leadership is filled with prescriptions that reflect how people wish those in positions of power behaved. There is no doubt that the world would be a much better place if people were always authentic, modest, truthful, and concerned about others, instead of simply pursuing their own aims. But wishing that’s how people behaved won’t make it so. 3) Your Delicate Self-esteem: If people intentionally do things that could diminish their performance, they can view disappointing outcomes as not reflective of their true abilities. For instance, told that a test is highly diagnostic of intellectual ability, some people will choose not to study the relevant material or to practice, thereby decreasing their performance but at the same time providing an excuse that doesn’t implicate their natural ability. Similarly, if people don’t actively seek power, the fact that they don’t obtain it doesn’t have to be seen as a personal failure. Shape behavior through rewards and punishments. So, welcome to the real world. It may not be the world we want, but it’s the world we have! Go here for the HBR article page. And here for the HBR IdeaCast podcast page for Jeffery Pfeffer's interview - Telling The Truth About Power. Go here for Jeffery Pfeffer's official page at Stanford University.